Little boys love being superheroes. Or at least THESE boys love being superheroes. And I know that they won’t always care about this sort of stuff. It won’t be long before they’ll scoff at an Auntie A made cape as being for babies. And so, while I can, I’m enjoying making them things to help them pretend. 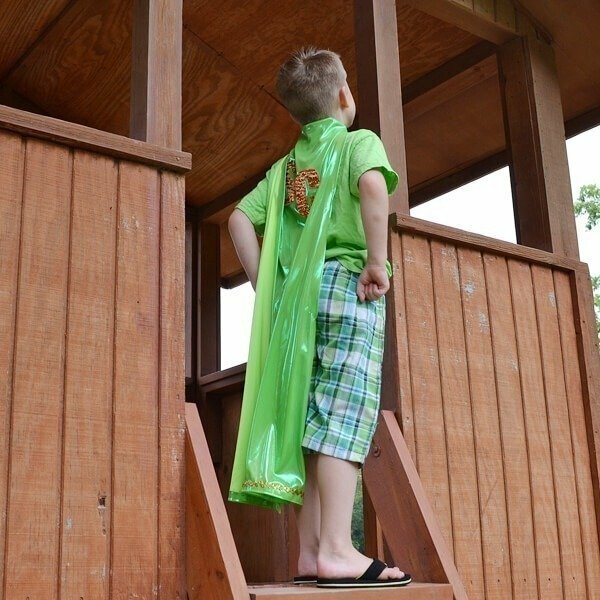 They pretend that they are saving the world, or just saving the dog from a particularly nasty dog napper… whatever it may be, they’re flexing their creative muscles and enjoying imaginative play. 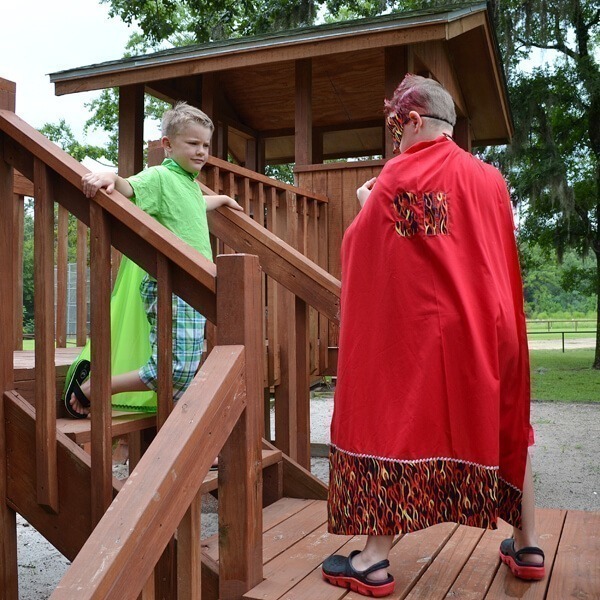 This is the second round of capes the boys have had. The first were very basic. I started working on them just before my dad had open heart surgery and then my grandmother finished them up while I spent time at the hospital. They were made using fabric found in Momma’s stash and some felt that I had on hand. This go we visited the craft store and each kiddo picked out the fabric and adornments they wanted for their cape. Last time we had strings to tie the capes on. This time we used Velcro. In the end, these are much flashier but also much easier because they were no sew! Well, mostly no sew. I must admit they wore out the adhesive holding on the Velcro pretty quickly so a quick tack on with some thread and we were back in business! 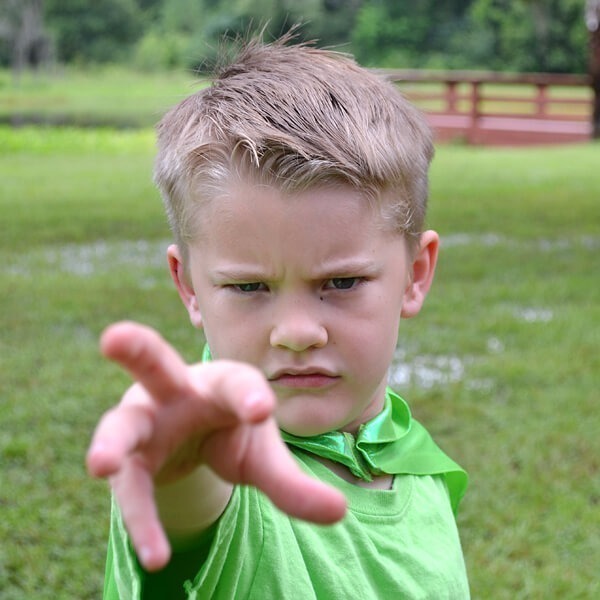 Want to make the little ones you know into superheroes with some awesome no ? Let’s get it! 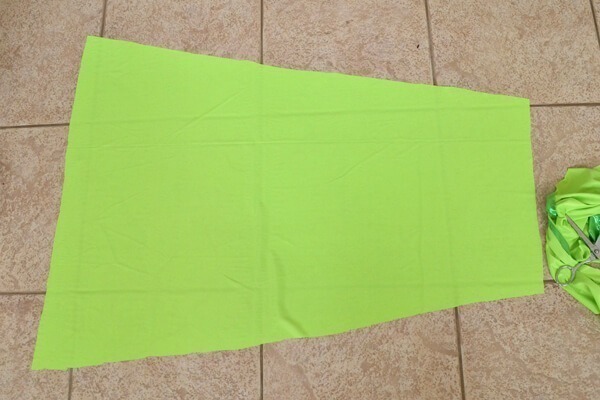 Cut your fabric into a shape similar to this one. The exact science of this process isn’t exact at all. Measure the width of the child’s shoulders around to center of chest where the cape will close up and stick on. Add about 2 inches to that number and cut your skinny end to match up. 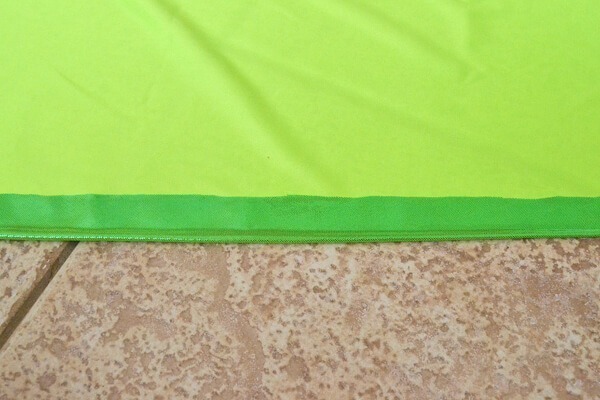 Again, not terribly specific, but trim out so that the other end of the cape is wider. Take your tape and roll it down the long end from the neck of the cape to the end. 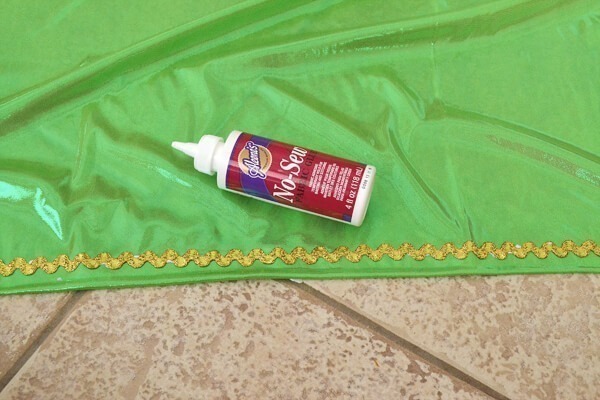 You can trim up the extra fabric here if you choose. 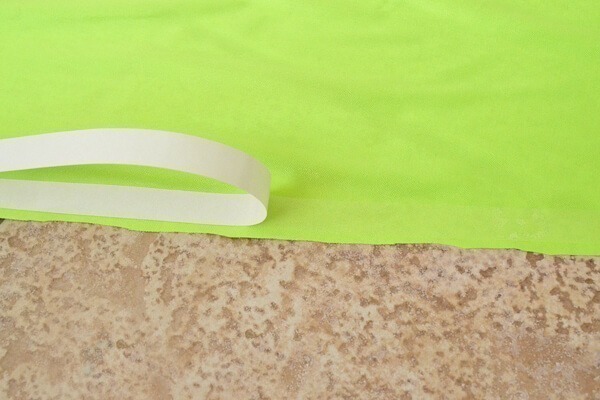 And fold the fabric over to make a neat and super easy hem without sewing! Continue for all four sides. 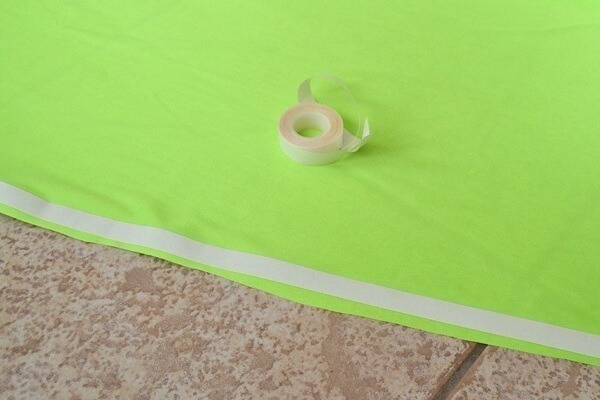 Finish by applying the Velcro. Again, I wound up having to sew it down. The adhesive worked well for a while, but these two boys were just too tough on it and pulled crazy hard. Embellish as you see fit. We used gold ric rac at the bottom of this one. To cut out letters like SH or SC as we had, use your double sided interfacing by first ironing onto the backside of your cloth. 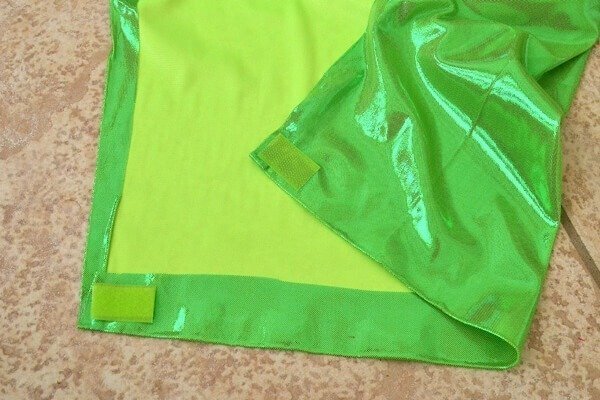 This is a satiny material with lots of slink and the interfacing made it MUCH easier to work with. Cut your letters out (we used printed letters out of Word as templates). 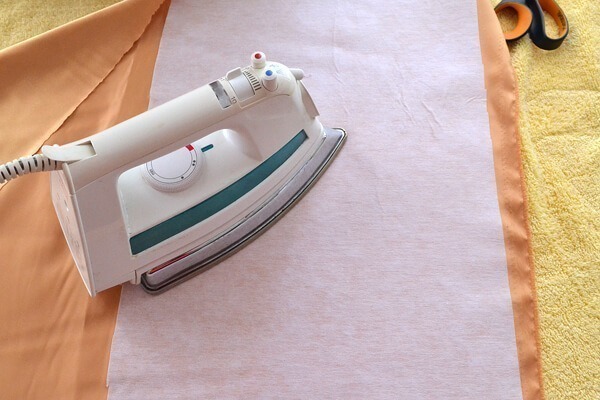 Peel the paper from the interfacing and iron directly onto the back side of the cape. You can further embellish how you see fit. 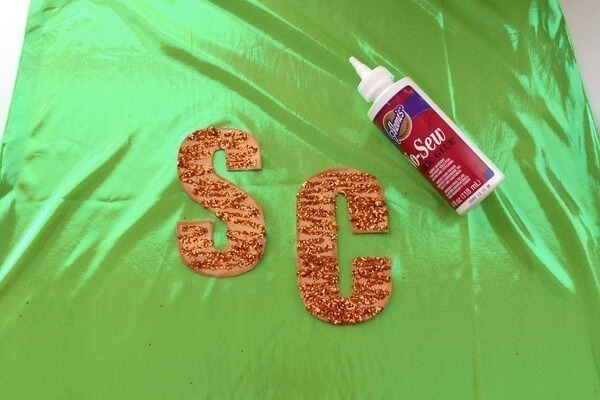 Kid wanted orange zebra stripes of glitter on his gold SC so we rocked it with more of the No Sew glue. This guy chose some fabric that is really soft and sort of glittery and very shiny. I’ve never sewn on anything like this so using the fabric tape was awesome! I just knew if I tried to sew it that the fabric would have slipped and slid all over the joint. 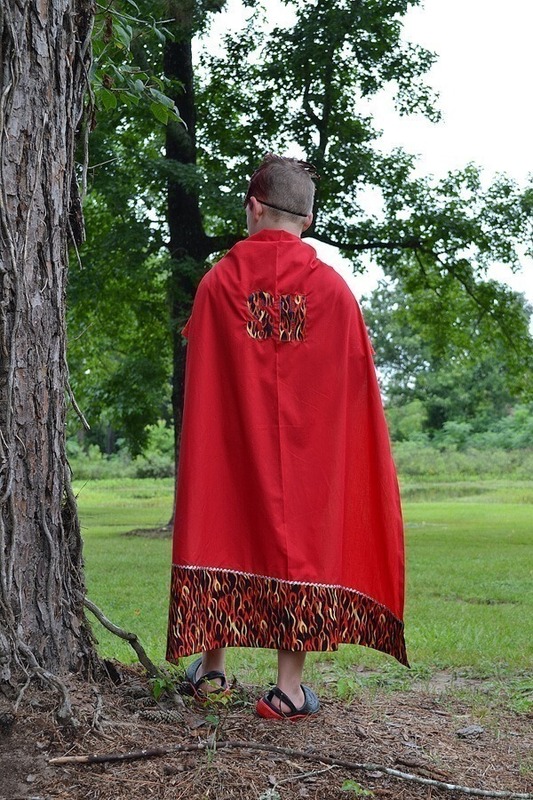 The fabric choice really works well for the cape and his is super light and flowy. He’s not much for the theatrics of it all so he just wanted a matching tee shirt to complete his superhero ensemble. He explained that he’s “going at it like Batman” and needs no stinking mask! 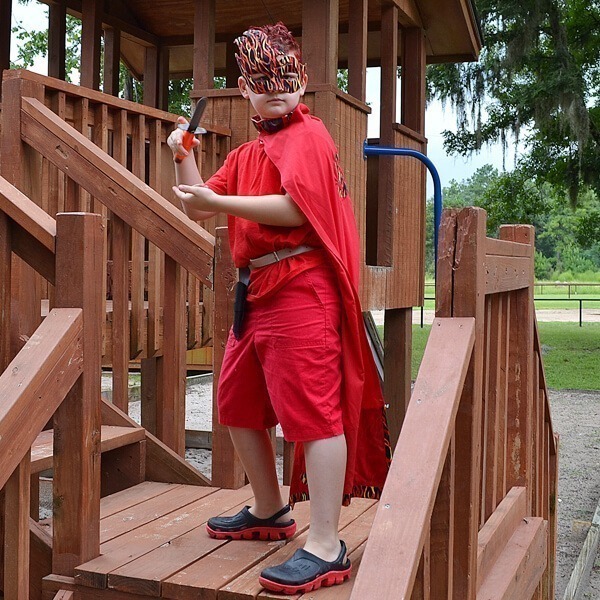 The older kid really, really got into the spirit of the thing borrowing Yaya’s belt and Chief’s holster. He has a stunt knife from Michael’s with neon orange Duck Tape making the handle more suited to the color scheme. We made the mask using fabric with flames and Aleene’s Brush On Tacky Glue – and this stuff is freaking amazing. Never used it before this project but am IN LOVE with the stuff now. Oh, and there is red tinted gel only on the side of his head that doesn’t have that fancy flourish covering it from the mask. He selected regular old broadcloth and calico for his fabric choices. His cape is more stable, I guess you’d call it and doesn’t really move around except straight behind him. Since the flames weren’t stitched on and had kind of a rough edge, we covered the “seam” with some silver ric rac glued on. 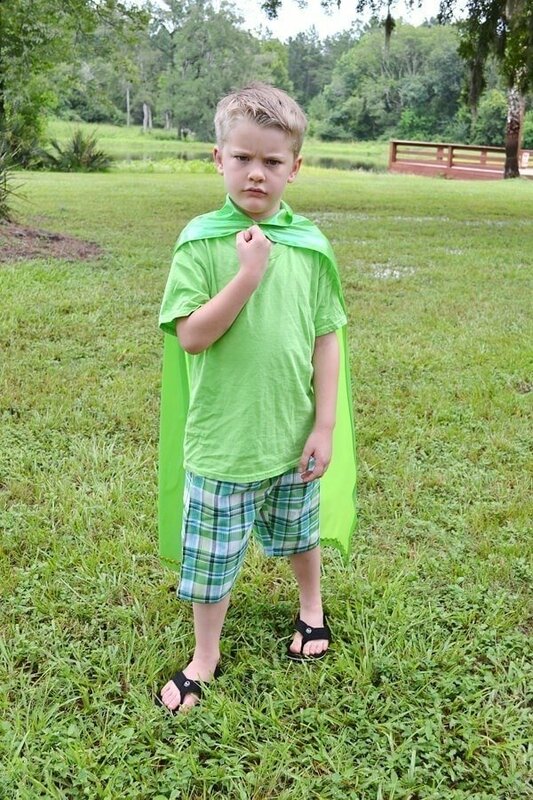 It took some doing but he turned his no sew superhero cape into a full on superhero ensemble with a bit of planning! After they got all dudded up, we headed to the park for some superhero training. and a whole lot of superhero drama! 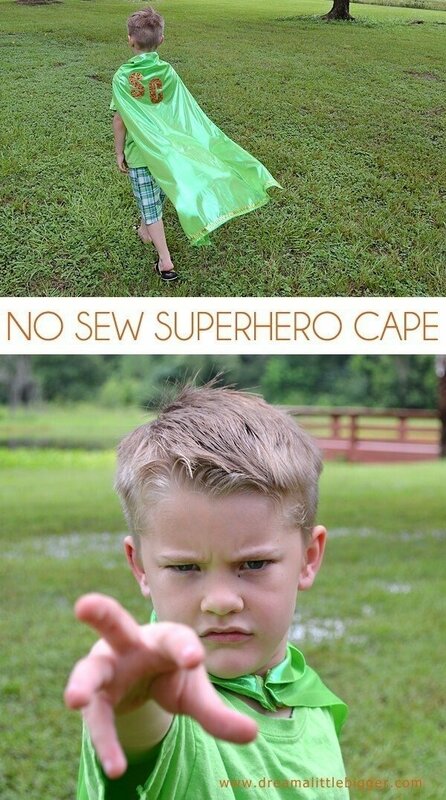 Even if you’re not the sewing type of person, you can totally rock out a cape for the little ones you know. 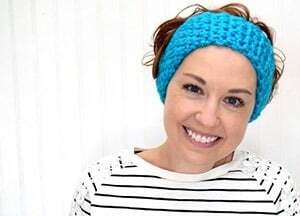 It’s super easy and can be super custom! 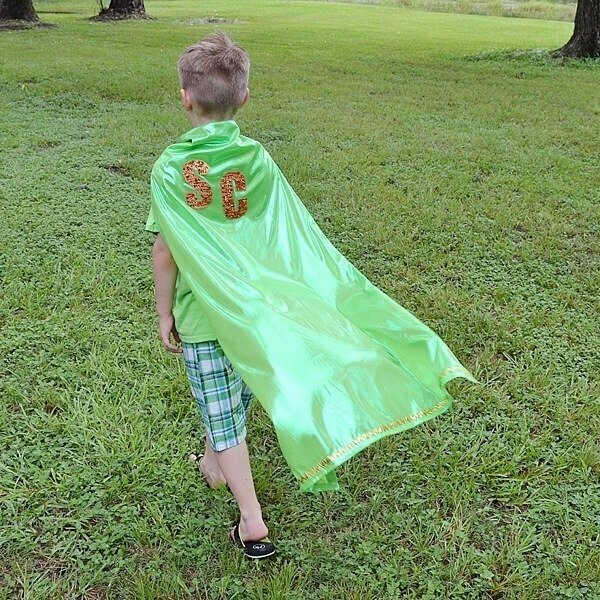 I made all of my nieces & nephews on my husbands side Super Hero capes for Christmas. I was a little iffy about making one for my oldest nephew because he was 15. However, I did it because I remembered feeling left out as the oldest when adults had decided I was too old to like something. It turned out that he loved it. He invented a whole other alter ego, who could drive, of course. The three oldest boys 15, 13, & 11 then invented a whole story line and had all of their younger siblings & cousins acting it all out. So, you never know. Here are their pics: http://pickledokra.blogspot.com/2014/02/a-simple-superhero-cape-pattern-tutorial.html The pics aren’t that great, but it was super fun! Have a great day Allison!